Patrick Alexander raised his family in the Bordeaux wine country of S.W. France, the Piedmont wine country of N.W. Italy, and the wine country of northern California before moving to Florida. As Director of the Office of Professional Advancement at the University of Miami he developed a popular wine appreciation program which was offered exclusively in the Faculty Lounge. 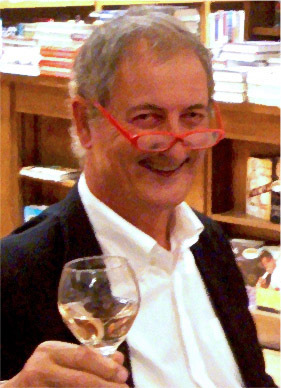 Patrick is also a published author of 'The Booklover's Guide to Wine' which was released in September, 2017. Other books include 'Marcel Proust's Search For Lost Time', 'The Nigerian Letter' and (UK only) 'Recollections Of A Racketeer.' and his novels "Death on the Eighth" and "The Cuban Factor" shortly thereafter. Wine Basics 101: After leaving the University of Miami to focus on writing, Patrick refined the wine program into a series of six, two-hour classes which he taught at UM's Osher Lifelong Learning Institute. For the past six years Patrick has been offering the same six-week program to sold-out classes at Books and Books' store in Coral Gables. Ruth's Chris: Patrick hosts the occasional wine-pairing dinner at the Coral Gables Ruth's Chris Steakhouse on Aragon Avenue. A recent dinner featured a Grand Tour of Europe, sampling the local wines and food of France's Loire Valley, Spain's Rioja region, Italy's Tuscany province and concluding with desert in the Mosel Valley of Germany. For details contact (305) 461-8360. Books & Books: This 12-hour program is offered to a maximum of 16 students, every 6 weeks at Books & Books. The Books & Books version is unique in that it culminates in a delicious food and wine-pairing dinner designed around the four wines that the students vote most popular. Celebrity Chef Allen Susser takes the four wines which the students have selected and designs a delicious four-course meal to bring-out and enhance the flavors of both the wine and the food. See "Class Dates" for start of next program and 'click here' for a review in the Miami Herald. "Granada and the Wines of Spain"
"Aix-en-Provence and the wines of the Rhone Valley"
"Cartagena and the Spirits of Colombia"
"Pisa and the Wines of Tuscany"
"Quebec and the ice-wines of Canada"
"Curitiba and the wines of Brazil"